Previous PostThe Painful EHR TransitionNext PostHas REDUCE-IT Resurrected Fish OIl Supplements (And Saved Amarin)? Great info as always. I had a near perfect lipid profile but self requested CAC scan just verify how healthy I was. Surprise! CAC score of 725. Now on Crestor and making other changes. What are your views regarding information that was in the July 2018 issue of The Lancet regarding low dose aspirin and dosing by weight? It suggested that low dose aspirin (less than 100mg/day) was not as effective for persons weighing over 70kg. I’m a 63 year old male who weighs 80kg and wondering what a protective dose might be? I had not seen the Lancet article. It’s fascinating. Seems plausible that we should be dosing aspirin by weight. I have complained about the absence of non enteric-coated low dose aspirin (https://theskepticalcardiologist.com/2018/01/28/which-kind-of-baby-aspirin-should-i-take-to-prevent-heart-attack-chewable-versus-enteric-coated-versus-regular/) and this new evidence suggests that those patients >70 kg should definitely not take enteric coated low dose aspirin. Interestingly, it is always my smaller, usually female patients who complain most about bruising from low dose aspirin. I will ponder this further and may start advising my >70 kg patients to take higher dose aspirin in the future. I buy non-coated aspirin on Amazon.com–available in both 81 mg and 325 mg tablets. 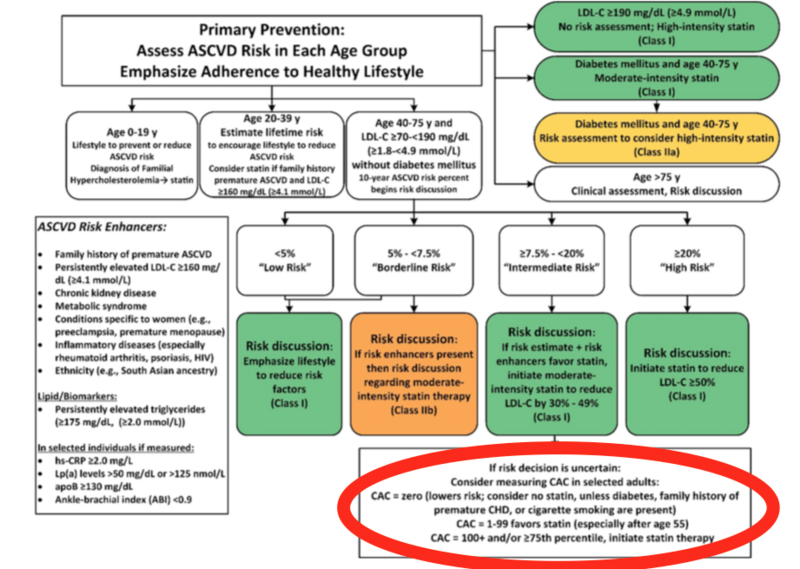 What a great step forward for heart calcium scoring Dr P. It’s always been a great tool that can re-classify intermediate-risk (middle-risk) people. Glad to see these recommendations in the AHA 2018 guidelines. Thanks for the summary. Sharing on SM. Are osteoporosis patients compromised when taking calcium supplements?